Get Ready for a whole new Artificial Intelligence-based Messaging experience. 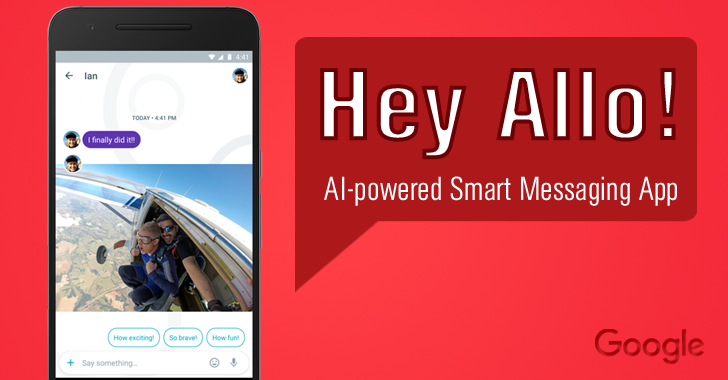 At I/O event Wednesday, Google unveiled its new messaging app named Allo: A smart messaging app powered with machine learning programming and the company’s newly announced AI bot Google Assistant. You just have to sign up with your phone number and link your Google account to Allo, and you are all set to go. With Allo, besides chatting with your friends and family using animated graphics and enlarging or shrinking text, you can also call Google within the app to buy things, plan events, and even think of what to reply, i.e. smart replies. I found Smart Reply feature a bit fascinating, as it offers you some assumptions that you can reply when someone says something, shares a picture or something else. This feature learns to get more smart and productive over time as you use it. Smart replies contain stickers and emoticons, as well. It recognizes pictures you or your friend sent by tapping into Google’s powerful image recognition search engine and learns your replies with the help of text. As I said, Allo uses Google search engine that is powered by Google’s own Knowledge Graph, so you can launch it by typing @google in the chat window while chatting with your friends. You can also make this AI bot to reserve restaurants and hotels, find sports scores, and everything that Google Search itself can do. Allo also offers end-to-end encryption, but it is not enabled by default. You have to enable "incognito" mode that turns on an end-to-end encryption system called Signal, designed by the privacy-focused non-profit organization Open Whisper Systems. So you can opt for incognito mode in Allo, which is similar to what you’ll already find in Google’s Chrome browser if you want your conversations to be private and secure. Besides end-to-end encryption, Allo’s incognito mode also features private notifications and expiring chats. However, there is one thing you need to keep in your mind that once you have deleted an incognito conversation on Allo, there is no way to retrieve it; it is gone forever. Besides Allo, Google also announced its new video calling app called Duo that will use end-to-end encryption, as well. "One of our favorite features of Duo is Knock Knock, which shows you a live video preview of the caller before you pick up." Unlike Allo, Duo video calling app is encrypted by default all the time. Both Allo and Duo will be available this summer for both Android as well as iOS platform, Google says.